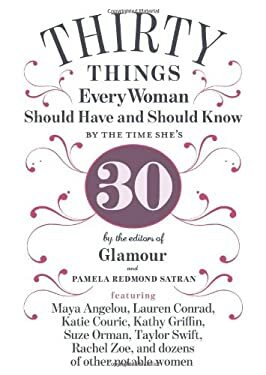 Fifteen years ago, Glamour published a list of distinctive yet universally true must-haves and must-knows for women on the cusp of and beyond the age of thirty titled, "30 Things Every Woman Should Have and Should Know by the Time She's 30." It became a phenomenon. Originally penned by Glamour columnist Pamela Redmond Satran, The List found a second life when women began to forward it to one another online, millions of times. It became a viral sensation, misattributed to everyone from Maya Angelou to Hillary Clinton--but there's only one original list, and it stands the test of time. Quirky and profound, The List defines the absolute must-haves (#11: "A set of screwdrivers, a cordless drill, and a black lace bra") and must-knows (#1: "How to fall in love without losing yourself") for grown-up female happiness. Along with essays based on The List, writers share their feelings about what the milestone of turning thirty meant to them. 30 Things is the one book women of all ages will turn to for timely and timeless wisdom.